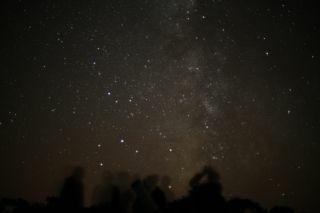 Stargazers on the Isle of Sark, in the Channel Islands off the coast of England, enjoy the wonder of the Milky Way. The Moon is not visible on the date of New Moon because it is too close to the sun, but can be seen low in the southeast as a narrow crescent the morning before, just before sunrise. It is visible in the low westsouthwest the evening after New Moon. First Quarter Moon, 2:18 a.m. The First Quarter Moon rises around 10 a.m., and sets around 1 a.m. The Full Moon of February is usually known as the Wolf Moon. In Algonquian it is called Snow Moon. Other names are Hunger Moon, Storm Moon, and Candles Moon. This Sky Calendar is provided by Starry Night Education with contributions by Larry Sessions and Geoff Gaherty.